My name is Lee Bice-Matheson and my coauthor, our son, is J.R. Matheson. There are 33 years between us making J.R. 23 and I’m 56. I was told by a Specialist that I wouldn’t live past the age of 40 so I wear the badge of 56 proudly. Lee: I began my writing career as a storyteller, often weaving tales for our son, J.R. Matheson. My stories parlayed into a writing career that was united with J.R.’s creative imagination, as a mom-son writing team. It is my dream come true! I am proud to say we have coauthored Destiny’s Gate, Book Two, and Shine Your Light, Book Three. 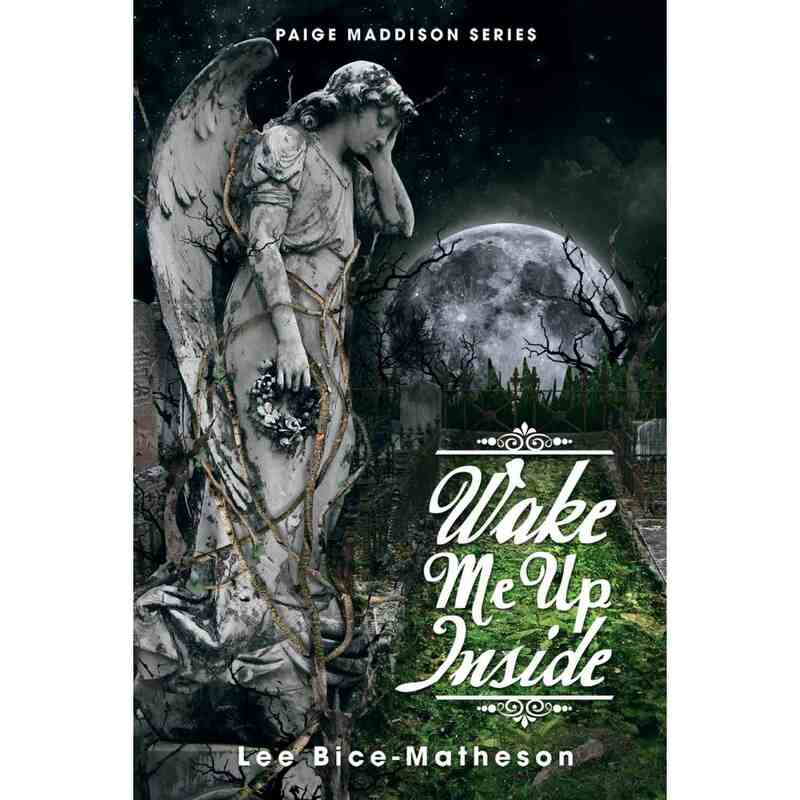 I am also the author of Wake Me Up Inside, Book One, in the Paige Maddison Series. It was the recipient of the Literacy Award from the Readers’ Advisory Panel, Orillia Public Library, and the Paige Maddison Series continues to be included in the Battle of the Books, Simcoe County. I am passionate about spirituality, and all it encompasses. I love spending time in nature, and canoeing and portaging into Algonquin Park with my husband. My degrees are in Honours History, Master of Library & Information Science, both from Western University. I’ve worked in public, medical, and corporate libraries, and now I work proudly with my husband, Kevin, in our Chiropractic Clinic. J.R.: I’ve been writing fantasy and horror since I was old enough to hold a pen. Collaborating on the Paige Maddison Series has reignited my passion for creative writing. When I’m not weaving tales with mom and coauthor, Lee Bice-Matheson, I can be found drowning in scientific publications and talking incessantly about my research at the Centre for Addiction and Mental Health (CAMH) in Toronto, Ontario, where I’m a pharmacology PhD student. Some may claim that science and the creative arts are at odds, but I feel they are one and the same. Lee & J.R.: We are over-the-moon happy with the reception of our new release Shine Your Light, Book Three, Paige Maddison Series. It is still on the Amazon.com Top 100 Best Sellers (1 month now) for our paperback edition, and just moved up to #2 HOT NEW RELEASES for Teen and Young Adult ghost stories. We couldn’t be happier. We have a Christmas book signing at Manticore Books, in Orillia, Canada, coming up on Saturday, December 17th, and many upcoming interviews and blog talk radio shows. We also have a book signing in our hometown at The Book Keeper, Sarnia, ON, on Saturday, January 28th, 2017, and then we kick off our book tour in Indigo/Chapters in February. All events are updated on our BkSigning / Events Page on our website. J.R.’s latest news: Well, since I’ve become a PhD student in clinical pharmacology at the University of Toronto, I have officially stepped down as my mom’s coauthor on the Paige Maddison Series. Shine Your Light was our last book together for some time but I hope to continue writing with Mom again someday. I conduct my research at the Centre for Addiction and Mental Health, which is one of the largest mental health and addictions hospitals in North America. My lab studies the effects of cannabis and alcohol on driver behaviour using a driving simulator. We also do a lot of population-level research, like tracking drug use patterns in Canada and studying the association between drug use and motor vehicle collisions. My personal research interests lie in understanding how cannabis affects brain functions like memory, attention, reaction time, and motor skills. There are a lot of misconceptions about cannabis use – many people don’t believe that cannabis actually affects driving. I think if we can show very clearly in the lab how cannabis interrupts normal brain function, we can help dispel this myth and reduce the impact of cannabis use on traffic fatalities. When & why did you begin writing? Lee: I read three books at a time as a young child and loved entering the magical worlds that the authors created. I especially enjoyed Lucy Maude Montgomery’s Anne of Green Gables and the Nancy Drew series. My passion for books transformed into storytelling for J.R. and my husband, Kevin, and then I began writing novels in 2008. J.R.: My Mom recently reminded me that I wrote short stories as a very young child for my English classes. I wrote my first book when I was ten years old, 2002. I’d been having a recurring dream, and it compelled me to find a way to dispel the dreams. Finally, I decided it was best to weave it into a story. I never had that book published, but I still consider it my first work, and it’s what helped me hone my writing skills early on. Lee: In 2008, I completed the Institute of Children’s Literature course on writing for children and teens. My instructor, Cheryl Zach, informed me that I could go straight into writing novels. I was absolutely shocked and thrilled. I am grateful to this day for her support and encouragement. J.R.: The day I saw my name printed on the cover of Destiny’s Gate, Book Two, was the day I considered myself a writer. It was a game-changer for me. We both write passionately from the heart. If this is considered a writing style, then here it is. The passion translates into lively dialogue, action-packed scenes, and truth and honesty in our characters’ portrayals. Several titles came to mind all in one day and I shared them with J.R. Thankfully, he picked Shine Your Light. As J.R. pointed out – Paige Maddison is always trying to ‘shine her light’ helping others, ahead of herself. How much of the book is realistic and are experiences based on someone you know, or events in your life? We’ve been told that many parts of the novel seem realistic. We are happy to hear this as we want our readers to experience Paige’s life, her journey. We believe all writers include parts of themselves in their writing … as did we. What books have most influence your life? A mentor? Lee: Books that have influenced me are the Nancy Drew series, the Hardy Boys, and many of Stephen King’s early works such as It, Carrie, and The Shining. Peter Straub’s Ghost Story really captured my imagination and I passed the novel along to J.R. My mentor is John Robert Colombo, Canada’s Master Gatherer, and his lovely wife, Ruth. They have published many books between them and they were professors at York University. They taught me to believe in myself. I believe the success we are seeing is a direct result of their nurturing guidance. J.R.: The Harry Potter books were probably the first books to get me really excited about reading. The “horror side” of me was definitely influenced by reading Stephen King and Peter Straub when I was in elementary school. Pet Sematary and Ghost Story are the two novels that stand out. Never Let Me Go by Kazuo Ishiguro is probably the novel that most influenced my life, or at least the way I see the world. It made me realize how much I romanticize things in my life, and it helped me get in touch with a deeper emotional side of my personality. Are there any new authors that have grasped your interest and who is your favourite author and what is it that strikes you about their work? We have to apologize for being so wrapped up in the Paige Maddison Series. It is a full-time job writing, publishing, and marketing three novels. We haven’t looked around for new authors and their works but we’ll be able to soon do this in the next year. Our book was just released November 15, 2016 so it takes precedence in marketing, especially at Christmas time, the biggest book buying season of the year. Name one entity that you feel supported you outside of family members? In the past few years, our Facebook community has been our biggest driving force. We have a community of over 9,300 supporters and our FB friends Like, Comment, Direct Message us giving feedback on our series. It keeps pushing us forward. Our Super Fan in 2015, Siobhan Quinlan, has motivated us more than she knows. Thank you, Siobhan! Lee: I absolutely see writing as a career. We wouldn’t change a thing in Shine Your Light. The feedback from readers has been supportive and encouraging. Lee: Two things: While hiking along many Ontario trails, there was always the concern of wild animals, namely bears. I would make up stories for J.R. and Kevin as we walked along. J.R. and Kevin insisted that I start writing the stories down and to share them with the world. And, I work with my husband in his Chiropractic Clinic, and one day he said to me, “For all of the years that you have worked with me and supported our clinic, and raised our son, I wish you would find something you love to do. You deserve this because you’ve done so much for J.R. and me.” J.R. and Kevin are my inspiration for writing. They are my cheerleaders. J.R.: I started writing to have an outlet to engage with my dreams. I have very vivid dreams and I just feel the need to write them down sometimes. and snow drifts, and I viewed the scene as if through the lens of time-lapse photography. I sensed danger was near, yet felt warm and peaceful inside. And then I sensed nothing at all. Once the manuscript is completed, we edit and re-edit it until the last possible moment before it goes to print. It is the most difficult phase of writing for us. We have often changed the ending at this time, and fine-tune the details. J.R. and I do a lot of book signings but luckily they are in the Toronto, and surrounding GTA, and our hometown of Sarnia, ON, Canada. However, for research purposes, we have travelled to New York, Boston, and parts of the Florida Keys for information specific to our series. Recently, and closer to home, we have done research on wolves with the help of the Haliburton Forest and Wildlife Reserve at their Wolf Center. Nancy Batra, Illustrator/Designer, created our book cover. We love it and we hope the readers do too. My sister, Cindy Slipacoff, designed the two sketches of the O’Brien Estate and surrounding area which are new in Book Three. Thank you to these very talented artists! Lee: The hardest part for me was dealing with a new character J.R. created. Her name is Annie Ariana Booker. She is scary even for me. J.R.: My pursuit of research and becoming a professor keeps me very busy so probably finding time to write together. We did this via Skype, emails, and using Dropbox. However, on many family holidays, mom and I were off by ourselves writing Paige’s journey. The best thing we’ve learned during the writing process is listening to each other with respect and knowing how rare it is to be part of a Mom-Son writing team. We were warned that it often turns into resentment and bitterness. Writing two novels together has brought us closer which we did not think was possible. We’ve always been close and happy to say, we will remain so. If any of your books was made into a film, who would you like to play the lead? We have had many companies that have approached us about putting the Paige Maddison Series on TV or as a movie since the first novel was released in 2010. We have so far said no to this idea. However, if someone was to play Paige Maddison it might be Ariel Workman from the sitcom Modern Family. She’s smart and funny and could play Paige hands down. Lee: If you’re going to be a writer and eventually an author (selling books), be passionate, stay true to your calling, and don’t sacrifice your words or your messages to please others. An honest work written from the heart is the key to writing a novel readers will want to buy. Do your research. Even in fiction, a lot of the information is based loosely in fact. J.R.: Write a little bit each day. Don’t take too long of a break from your story, or it will slip away from you! Thank you from the bottom of our hearts to our supporters and book buying readers of the Paige Maddison Series. We wouldn’t be continuing this journey if it wasn’t for you. Also to our new readers, we hope you enjoy Paige’s spiritual awakening. We want people to ‘shine their light’ in the world we live in and we’ve been told our books help many to see ‘the light.’ Please leave honest and constructive reviews for any of your favourite authors on Goodreads, Amazon, Google Play, Barnes and Noble, or any online bookstore. It is one of the main ways to give feedback to help authors understand how their work is being received or how it could be tweaked to make it better. Lee: I mainly read non-fiction books as a part of my research for the Paige Maddison Series. I do not read fiction while I’m writing for fear I might take someone else’s idea(s). J.R.: Many, many research papers. Do you remember the 1st book you read? Lee: I’m positive it was Cinderella. And, I’m not sure of the title, but I’m pretty sure alongside of Cinderella were a couple of books with ghost stories. J.R.: I remember reading all of the Dr. Seuss books. But my first recollection of reading on my own was probably Goodnight Moon by Margaret Wise Brown. Lee: Watching my husband laugh so hard he’s crying, makes me very happy and laugh loudly. What makes me happy-cry are the reality shows, like The Voice, or Survivor, when someone wins and their dream comes true, or they sing that high note they didn’t think they could make, or a loner becomes a team player and overcomes their anxiety and fear like David on Survivor. I cry when I witness or read articles on poverty and how it effects children and stunts their growth both physically and mentally. J.R.: I laugh a lot. I even happy-cry somtimes. It’s usually at something very random, out of the ordinary. News of bullying makes me cry. Is there one person, past or present you would like to meet? Lee: For me it would be Albert Einstein. I love reading his scientific vs spiritual philosophy in his articles. J.R.: I still would love to meet Emma Watson aka Hermione Granger from the Harry Potter movies. I felt like I could relate to her geekiness. Emma is very academically inclined, herself, and I really respect that. She also started #HeForShe encouraging ‘men and boys to take action against negative inequalities women and girls may face.’ It’s something Paige Maddison would love to have done. Other than writing, do you have any Hobbies? Lee: I love to sail with my husband, dance, hike, canoe and portage into Algonquin Park, Canada. J.R.: I don’t have time for hobbies right now but I love to walk my dog, Abby. What TV shows or films do you enjoy watching? Lee: I love Grimm, sitcoms like Mom, dramas like Saving Hope, and the comedic Castle. I am sorry they cancelled the show. He was an author and I loved his sense of humour and watching his family interact with one another. I still enjoy Bruce Willis in the Die Hard movies, Aliens with Sigourney Weaver. And pretty much anything Roma Downey is involved with. J.R.: I’m a huge fan of horror movies. The past few years in particular have seen a number of amazing new horror movies – It Follows, The Witch, You’re Next, and so on. It’s a great time to be a horror fan. I’m much more varied with my TV shows; I like to watch a lot of light sitcoms like The Office and Modern Family, but I’m also a sucker for good HBO shows like Game of Thrones, and more recently, Westworld. Lee: My favourite foods are: guacamole, shrimp cocktail, veggies & dip, salmon, pickerel … fish of any kind. My favourite colour is royal blue. My favourite music is pop music like ‘This Girl’ by Cookin on 3 Burners (Australia), Evanescence, Adele, Michelle Qureshi’s New Age music … great for meditating, Maroon Five, and classical music. J.R.: I love international cuisine such as Korean dishes, Chicken Masala, authentic Chinese food. I love hummus, stir frys, and I make a tasty caesar salad. My favourite colour is red. I don’t usually have favorite artists. I listen to a broad range of music, from house music and electronica to classical music. One of my favourite singers is a Danish songwriter named Agnes Obel. I’ve seen her in concert twice, and she has an absolutely beautiful voice. If you weren’t a writer what else would you have like to have done? Lee: I absolutely wish I could sing. I would love to make people happy singing to them. J.R.: I would have loved to be a chef. I’m told by my friends and family, especially my mom, I’m a great Amateur Chef. Thanks, Mom! Thank you so much, Fiona, for having us back on your blog Authors’ Interviews. We are delighted to share our news with you and your book lovers. J.R. and I wish you, your family, and your readers a very Merry Christmas and a Happy New Year. Happy Holidays! Best in health, Lee & J.R. Watch out for those ghosts! Sarnia, Ontario, Canada located on the Canadian/U.S. border. Our neighbouring city is Port Huron, Michigan, U.S.A.
We are a Mom-Son fiction series fantasy-adventure writing team and rumoured to be the first of its kind. Lee has an Honours B.A. in History, as well as a Master of Library and Information Science, both from Western University in London, Ontario. Lee is also a graduate of the Institute of Children’s Literature. J.R. is currently finishing his fourth year of a B.Sc. in Psychology and Biotechnology from McGill University in Montreal, Quebec. 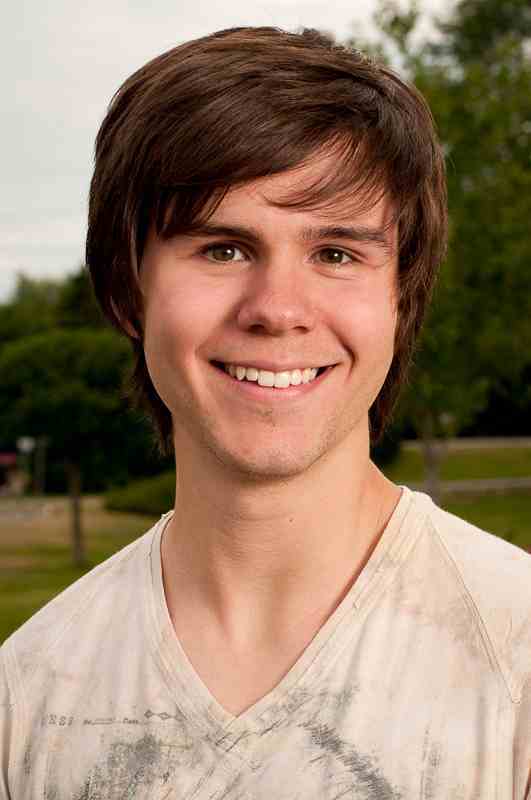 He is planning on pursuing a Master’s degree in Neuro-Pharmacology at the University of Toronto in the fall of 2015. J.R. is the only child of Lee and her husband Kevin. We are a close knit family that loves to sail, hike, watch scary movies and tell tall tales around the campfire. Today, we’re happy to be working on this interview for you, Fiona. And on Tuesday, December 23rd we have our first radio show with CK Webb and DJ Weaver on Webb Weaver Books, noon EST. It’ll be the first time that I am reading from newly released Destiny’s Gate live. We are lucky CK and DJ asked us to come back; my mom was on their show in September. We are happy to report we are currently working on book three in the Paige Maddison Series over the holidays. Lee: I read three books at a time when I was a young child and really identified with the imaginary world so many writers have created. As I grew older, I felt I expressed myself best through storytelling and that morphed into writing stories down on paper at the insistence from J.R. and my husband Kevin, more than 10 years ago. Justin: I’ve been writing since I was so young, I can’t even remember why I started. All I know is that I love it! Lee: In 2008, when I finished the post-graduate writing course at the Institute of Children’s Literature, my mentor Cheryl Zach informed me that I was a talented writer and could go straight into writing books. Thank you Cheryl for your encouragement and support! 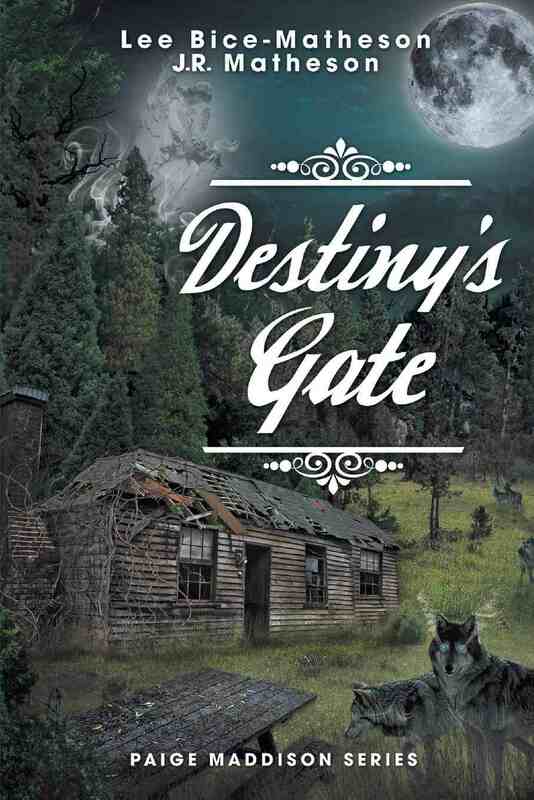 Justin: As soon as I saw my name printed on the cover of Destiny’s Gate, I finally felt like a writer after a lifetime of writing short stories and filing them away. Lee: After the loss of seven loving family members, I was surrounded with illness and death. I felt compelled to write ghost stories centered on a strong loving family that pulls together in a very difficult time. Justin: I wrote my first book when I was about 10. I’d been having a recurring dream, and I felt that the best way to dispel the dream was to weave it into a story. I never had that book published, but I still consider it my first work, and it’s what helped me hone my writing skills early on. Lee: The jury’s still out on this one! We feel our writing style is simple but passionate. Lee: We did not come up with the title Destiny’s Gate until the seventh or eighth round of revisions. The current book was always referred to as “book two.” One day, the title came to me and it just made sense within the storyline. Readers will have to pick up the book to understand the meaning of Destiny’s Gate. J It is central to the series. Lee: Yes we do. “Live from a place of love. It conquers all that is evil.” That is our tagline for the book and we stand behind it 100%. Lee: Our book is loosely based in fact. Lee: The events in the book come mainly from experiences in our own lives, but also from the experiences of people close to us. Sometimes, we include experiences that occur to others that we have read about. Lee: Anne of Green Gables by Lucy Maud Montgomery, It by Stephen King, and Ghost Story by Peter Straub. The Nancy Drew series also had a big influence on me and my writing. But what most readers do not know, I owned and read every Dr. Seuss book as a young child. I loved them! J.R.: I grew up reading Harry Potter, and my love of fantasy definitely was influenced by that. A little bit later in my childhood, I also read a lot of Dean Koontz books, and I have to say my love of horror-mysteries probably came from him. The Secret History by Donna Tartt also had a strong influence on my academic aspirations and my writing style as well. Lee: John Robert Colombo, Canada’s Master Gatherer, author and anthologist of over 200 books. If it wasn’t for JR Colombo, I would not be writing. I wrote two narratives for him that he actually ‘stopped the presses’ to include them as the ending of his book, The Big Book of Canadian Hauntings, c2009, Dundurn Press. Afterwards, I emailed JR a few chapters from book one, Wake Me Up Inside, and he advised me on writing style and has encouraged me ever since. Thank you kindly, JR and also, his lovely wife, Ruth! J.R.: I would have to say Dean Koontz. Most of my earliest stories were in a similar style to some of his great horror tales like The Taking and Seize the Night. Lee: Grimm’s Complete Fairy Tales, Canterbury Classics, c2011. I found an elegant edition while at a book signing at Blue Heron Books, Uxbridge, Ontario. Thank you, Shelley! J.R.: I just finished the Inheritance Cycle by Christopher Paolini, and I’m about to start Mockingjay by Suzanne Collins. Lee: We’re sorry to say we’re too focused on the Paige Maddison Series to keep up with emerging new authors. We’re pretty new ourselves! Lee: Absolutely. It is a calling that we feel very grateful to have in our lives. Lee: My interest in writing came from reading so many books as a young child. I wanted to be just like the authors, a writer! Lee: Sorry, it’s top secret. Lee: Choosing the best adjective is always challenging when creating a scene. Lee: I don’t have a favorite author, presently. I love to read a variety of books, and I read a lot of nonfiction. I never read fiction while writing a book as I do not want to borrow someone else’s ideas. J.R.: My favorite author is probably Dean Koontz, as I’ve mentioned. His fast-paced style of writing, the depth of his characters and the creepy, engrossing storylines he comes up with have really influenced the sorts of stories I like writing myself. 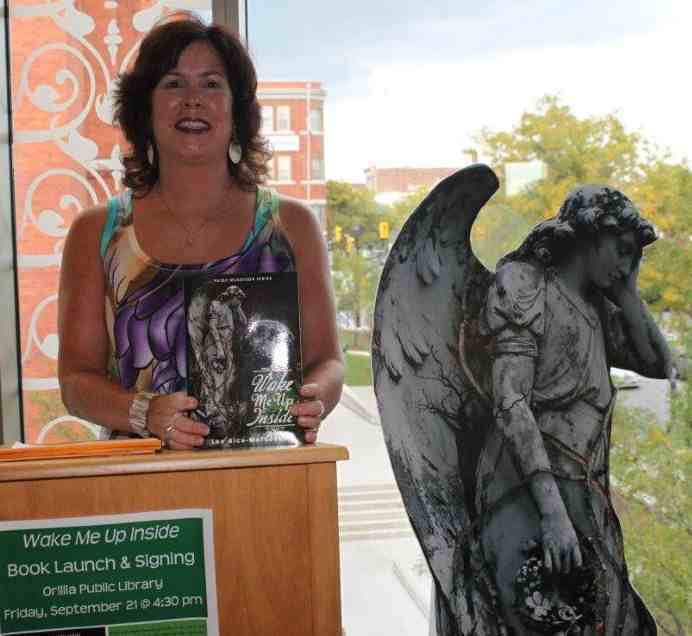 Lee: I travel around Ontario quite a bit to perform book readings and attend book signings. I also was asked to present a Teen Writing Workshop at the Gravenhurst Opera House about a half hour’s drive from where we live. I loved it. The kids were great! I also attended the biggest inaugural book fair called INSPIRE! TIBF held in November from the 13th to 16th at the Metro Toronto Convention Centre. Next year, J.R. will be with me! Lee: Effigy Design owner Adam Dagenais, a local graphic designer. One book fair attendee in Toronto said that our covers were the most artistic of the more than 400 authors and their books on site. Lee: The hardest part is probably getting the revisions back to each other in a timely fashion. But we managed to do it! I work with my husband in his chiropractic clinic and J.R. has been attending McGill University in Montreal, so we are both quite busy. Lee: I feel like all authors learn a lot about themselves through the process. It seems to be a form of therapy, whether we admit it or not. Haha. Lee: You must stay focused and passionate and continue to regard the writing as an honour and a privilege, not as hard work. My husband says I’m the happiest when creating and writing a novel and he loves to see it! J.R.: Write a little bit every day. Don’t let too long go by without looking at your story or you may find it slipping away from you! Lee: We want to thank our readers for not only buying the books but also for writing us privately about their experiences as they traverse through the world of Paige Maddison’s. We hope that readers will continue to review our books on GoodReads and Amazon. That’s our Christmas wish from our readers this year. J Thank you for your support to #Indie #Authors. Lee: The first thing I remember reading is Cinderella. Typical isn’t it? Lee: I have a very funny sense of humour and I love to make other people laugh, so I often make fun of myself. That makes me laugh! It makes me sad when I see people suffering in this world. J.R.: I laugh a lot! I even happy-cry sometimes. I don’t know if there is one particular thing that makes me laugh or cry. Lee: I would love to sit down with Edgar Allan Poe. His writing is included in both of our books, and I feel he was a very misunderstood man. I would love to hear his thoughts on his own writing. J.R.: I would love to meet Emma Watson. Hermione Granger is probably my favourite literary character; I felt like I could relate to her geekiness. Emma herself is very academically inclined and I’ve always respected that. Any chance you could make an author’s wish come true and introduce me? The UK isn’t that big, right? Lee: Herein lays a fun, loving mom and wife that truly put her family first. I love my family so much and hope I’ve been a supportive, loving spouse and mom. J.R.: Hopefully I won’t have to think about this for quite some time. Lee: I love to hike and be in nature. It makes me feel connected and grounded. J.R.: I play a lot of video games! Lee: I cannot live without Grimm, Saving Hope, and Stalker. I also like the reality TV shows Survivor and The Voice. I like to watch inspirational, uplifting movies. One of my favorite movies is Bless the Child. J.R.: I watch a lot of TV shows, so get ready. My favourite show of all time is Buffy the Vampire Slayer. I love pretty much anything Joss Whedon does. I also love True Blood, Parks and Recreation, Bob’s Burgers, Family Guy, Arrow, The United States of Tara, Game of Thrones and the 4400. Some of my favorite movies include Kill Bill: Volume 1, The Descent, X-Men: The Last Stand, Insidious, Crouching Tiger Hidden Dragon (and pretty much any wuxia movie with Michelle Yeoh), and the Lord of the Rings trilogy. I love so many more, but I don’t want to bore readers! Lee: I would love to be performing onstage as a solo pop artist. Thankfully for the people, I’m not. J.R.: I’m still in school, and I’m on my way to become a professor! Lee: It is http://leebicematheson.ca/ I post our events, media and information pertaining to our series on this blog. Thank you so much, Fiona!! We were so happy to do this blog interview for you. Thank you for the opportunity.